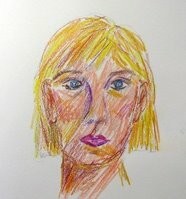 an open [sketch]book: is that a raccoon in your hair? is that a raccoon in your hair? I made a trip to the drivers license office earlier this week to get a new license with my new name (Suzanne Cabrera, for those of you wondering). Talk about a space void of inspiration... Eeeek. Being in spaces like this I think back to my trip to Venice where every space is beautiful...I wonder what the drivers license offices are like there? To make this experience worse, my license photo is...well..uh...interesting. Speaking of raccoons, while adding a title to this post spell check alerted me that "raccoon" has two "c's"...too bad my sketchbook doesn't have spell check as well. What a FUN post, I can relate on all levels here, I think spell check should be implanted in my brain ;-)I don'e know what happened, I used to be an excellent speller!!? 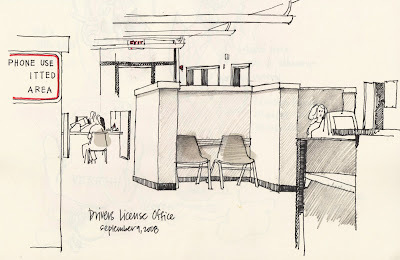 Maybe you can talk the drivers license office into exhibiting artwork of local artists? That's be so cool, and make the place look 100xs better! Those double c words throw me for a loop. I always have to pause before typing broccoli. Remember to update your passport as well-mail it in and they'll update it and send it back. I share this due to a near-tragic incident that occurred when I was trying to leave the country shortly after I got married-eek! All I can say is I'm glad I'm not the only one. Check out my "oops" — which spell check wouldn't have caught. I've been loving seeing your sketches again. Thanks for all your good ideas...from artwork exhibitions to passports...I need all the help I can get! 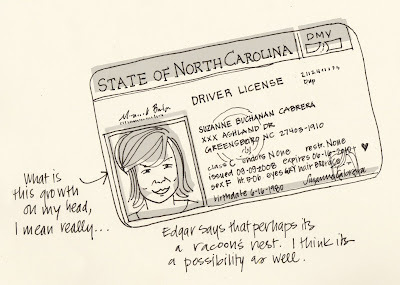 love the license ID sketch, it's amazing how the simplest and most mundane of things can be "a work of art" when sketched out, esp with the lovely talent that you possess... thanx for the inspiration suzanne!! How long does it take you to do something like the drivers licence sketch? i had fun reading this post. :) and i am fascinated by your bicycle sketch. I am fascinated with your blog. I love all of your work. Congratulations on your wedding(a little late, but this is my first vistit). Thanks you for your comments and encouragement. I am bookmarking you:-)! How cool! First of all, you captured the dreary surroundings of a Motor Vehicle Agency very well! And secondly, i too have to do the same -- meaning getting the name changed, and all that good stuff. Thought you might be interested to know that the Concise Oxford English Dictionary prefers "racoon" to "raccoon." Nice blog.